Stand up paddleboarding is an excellent full-body workout. This challenging and fun exercise works all the major muscle groups of your body (and believe me, you will feel it the next day). Strength, balance and flexibility are all important aspects to fun and effective paddle boarding, and yoga is an excellent practice to prepare your body and mind for the fun workout ahead on the water. This powerful and challenging posture builds strength, stability and balance in the whole body. Begin in a classic plank position and shift your weight onto your right hand. Roll onto the pinky side of your right foot and stack your left foot directly on top. Press the floor away from you and rotate your chest to face toward the side of your mat as you extend your left hand up toward the sky. Try to lift your hips up high away from the ground, fully activating into your obliques, to find balance and stability. Practice evenly on both side of the body. To paddle properly and efficiently, the technique requires full integration of the entire core system. The muscles of the thighs, glutes, abdominals, back, shoulders and arms must be properly prepared and engaged to effectively paddle while on the water. Dolphin pose is an excellent posture to engage the full body, specifically strengthening the shoulders, arms and upper back while simultaneously activating the core and legs. Start in a tabletop position and relax your forearms to the floor so that your elbows align directly underneath your shoulders. Hug your arms into the midline and press down firmly against your forearms. Relax your shoulders away from your ears and press your chest toward your legs. Lift your knees up off the floor and extend your hips to the sky (so you’re in a down dog position with your forearms on the floor). Walk your feet in toward your hands as close as is possible. Continuously press the floor away from you as you breathe deeply into all that you are working. Balance is obviously a huge part of standup paddle boarding, and there is nothing better to prepare you for precarious balances on the water than practicing balancing yoga postures first on land. 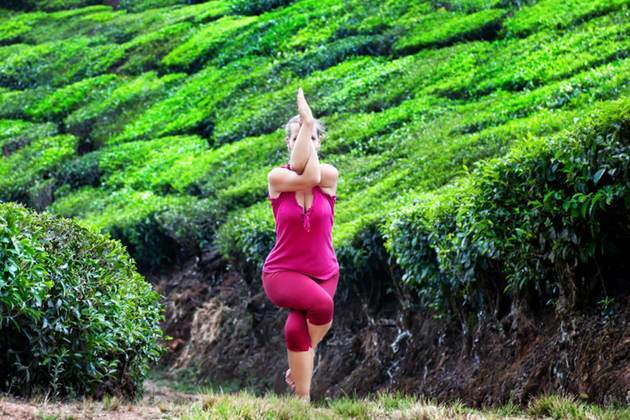 Start standing in a Mountain pose and shift your weight into one leg. When you feel steady, lift the opposite leg up high off the floor and open at the hip joint so that your knee points to the side of your mat. You can bring the sole of your foot either into your calf or up into your inner thigh (placing it anywhere on your leg other than the knee joint). Press your foot against your leg and press your leg against your foot, finding an equal balance of weight and energy. Take any variation with your arms that you like and be sure to practice equally on both sides. Warrior III is another excellent pose to practice your balance and to strengthen your legs and core. Start standing and bring your weight into your right leg. Lengthen your spine up and draw your palms to meet in front of your heart. Lock your gaze onto one still point and, as you exhale, lift your left leg up off the floor and immediately begin to kick and extend it back behind you while naturally allowing your torso to move parallel to the floor. Kick back with as much energy as you reach your heart center forward. If you would like, you can reach your arms forward in space and keep extending a balance of weight forward and back. Practice evenly on both legs. Another excellent pose to practice balance, which also opens the upper back and shoulders, is Eagle pose. It also strengthens the thighs, hips, ankles and calves, all of which are imperative to standup paddle boarding. 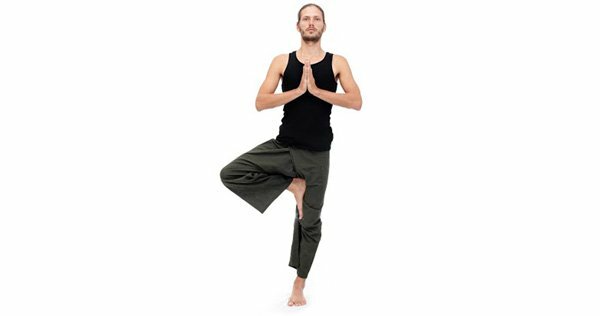 Begin standing in a mountain pose and shift your weight into your right leg. When you’re ready, lift your left leg up off the floor and cross it over your right (you can even double wrap your foot around your calf if it’s accessible to you). Give yourself a hug crossing your right arm over your left and draw your hands toward each other on your back. Either bring the backs of your hands or the front of your hands to meet and extend your elbows up toward the ceiling. Press your forearms away from your face to move your shoulder blades apart from each other on your back. Sit low into a squat and squeeze everything into the midline, hugging your legs and your arms together. Hold for a few deep breaths and when you’re ready, switch to the opposite side. Core strength is key when paddleboarding and Boat pose is an excellent core strengthener. Start seated with your feet planted flat against the floor. Draw your heels in close toward your seat and press down against your sit bones to extend your spine toward the ceiling. Take a hold behind your knees and draw your chest toward your thighs. When you feel balanced, lift your feet up off the floor and bring your shins parallel to the mat. Squeeze your legs toward each other and keep your spine elongated. If you’d like you can release the hold of your hands, extending them open to the side and you can even work toward straightening your legs while maintaining a lengthened spine. Hold for as long as you can maintain proper form. Stretching is equally as important as strengthening. Cow Face pose opens the hips, shoulders, ankles, thighs, triceps, chest and side body. It is a perfect posture for before and after paddleboarding to both warm-up and relieve tired muscles. Start seated with your legs extended in front of you. Cross your right leg over your left and draw your right heel toward your left hip. If it’s available to you, you can also draw your left heel toward your right hip working to stack your knees on top of each other as much as possible. Lengthen your spine to the ceiling and reach your right arm to the sky. Bend into your elbow and walk your hand down your back. Reach your left hand behind you and up your back, either holding a strap between your hands or interlacing your fingers. Press the weight of your head back against your right arm. Hold and breathe deeply before switching to the other side. A full-body strengthener, Plank pose strongly activates your arms, core and legs so it is a perfect prep pose for paddleboarding. Start in a Down Dog and roll your weight forward so that your shoulders align directly over your wrists. Spread your fingers widely and press the floor away with your hands. Create a straight line from the top of your head to your heels. Hug your bellybutton in toward your spine, engaging deeply into your core, and actively press your heels toward the back of your mat. Elongate your spine and relax your breath. Hold for as long as you can maintain integrity in the posture. Anyone who’s ever been paddleboarding in choppy waters knows that your thighs work overtime to stabilize your balance. Prevent not being able to walk the next day by prepping your muscles for the challenge. Chair pose works deeply into the thighs to prepare them for the hard work of maintaining balance on an unstable surface. to do this, begin standing in a mountain pose with your feet touching. Squeeze your legs into the midline of your body and, as you exhale, bend deeply into your knees, sitting low into a squat. You can bring your palms to meet at your heart or extend your hands up toward the sky. Lengthen your spine, relax your shoulders and sit deeply into your seat. Hold for as long as you can maintain proper form. Another great thigh burner, lunge positions also open tension held in the hips. Starting from Chair pose (described above), take a huge step back with your right leg so that you take up at least 80% of your mat. Align your left knee directly over your left ankle and kick your right foot toward the back of your mat. Relax the weight of your hips toward the floor but extend your spine up toward the ceiling, engaging into the muscles of your core for support. Reach your arms up and relax your shoulders away from your ears. When you’re ready, switch to place the opposite leg in front. Are you a SUP fanatic? What yoga poses do you practice before getting on the water?